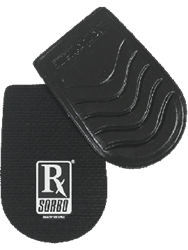 The RxSorbo web page showcasing running shoe insoles has been updated. Please visit it to learn more about insoles available for use with indoor footwear. You know how easy it is to talk about something that you’re really passionate about? Running shoe insoles is such a topic here at RxSorbo. RxSorbo, a leading online retailer of top-rated sport shoe insoles, is happy to announce that the informational page for running shoe insoles has just been updated. In order to choose the highest quality and best performance insoles for their sport, athletes need reliable information about these products. If foot pain is keeping you off the track, then you’re not getting the exercise you need to stay fit, which is not smart, or healthy. Running shoe insoles can make the difference between giving up and getting going. If you already have foot pain, then insoles can help with your recovery, by lessening the shock your body feels with each foot strike. Then, once you’re healthy, running shoe insoles can help you avoid further injury. To learn more about the running shoe insoles, please visit the updated page here: http://www.rxsorbo.com/insoles/running/. In addition, for those who are walkers and not runners, the walking page has also accordingly been updated. Visit it at http://www.rxsorbo.com/insoles/walking/. There, one can browse the company’s classic heel pads, classic insoles, and the all whole line of walking shoe insoles.